For as many funny people that appear in Office Christmas Party, it sure felt very unfunny and a big waste of everyone’s talents. T.J. Miller stars as Clay Vanstone who is the head of the Chicago branch of his family business, Zenotek. He’s a huge fan of Christmas and is looking forward to the annual office Christmas party and Secret Santa gift exchange. He starts to get bummed out when he senses a sad vibe around the office. His sister, Carol (Aniston), is the CEO of the company and pops in one day with some startling news. She’s the Scrooge of the movie and wants to cancel the party. That’s on top of taking away the annual Christmas bonuses and laying off forty percent of the staff. She threatens Clay that they need to gain a huge profit or else she will completely close the branch if it continues to under perform. Clay and his tight-knit colleagues, Josh (Bateman) and Tracey (Munn), decide to go after a high-profile client (Vance) who would be the game changer they need. The client is hesitant about the company culture due to recent rumors and a poor reputation. Clay decides to secretly throw the Christmas party against Carol’s wishes and invite him to the party in hopes of gaining his trust. It’s only a matter of time before the party gets completely out of control jeopardizing everything they’ve worked hard for. I always say that it’s a bad sign for a comedy when you have multiple screenwriters attached to it. For this film there are three writers credited with the film’s story while three other writers are credited with the actual screenplay. One would assume that out of those six writers there would be some consistency in the comedy, like even being consistently funny. Am I asking too much? It’s a comedy that rests solely on a concept without a thorough outline of how to make it work. 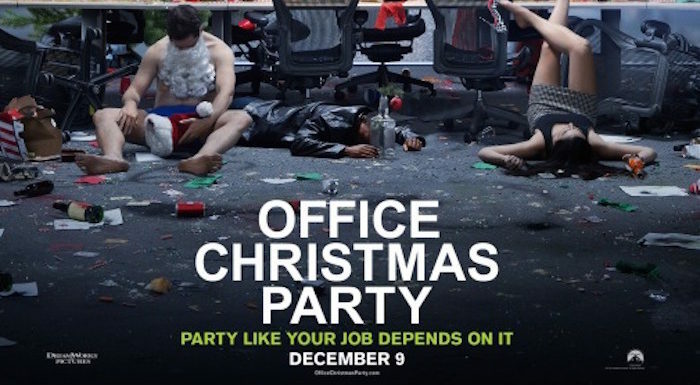 Sure, an office Christmas party that goes awry sounds pretty funny. We all get stressed and a little nutty at Christmas. Movies like The Hangover or Neighbors, where the events go horribly wrong and out of control, find a way to be consistently funny and at times shocking. It seems like Office Christmas Party wants to be that style of raunchy, hard R-rated comedy but can’t quite reach that level. It generally plays it too safe without going all the way. I attribute part of that to the film having too many characters and subplots. Again, this is a broad company, not a Robert Altman film. There is no need to have every office member struggling with problems. The Vanessa Bayer/Randall Park scenes could easily be cut. This isn’t a knock against them, but it’s just more wasted time away from the brother/sister relationship between Miller and Aniston. Then there’s Olivia Munn being a tech nerd who’s creating a brand new wi-fi for the city. What? Yes. The film opens with Jason Bateman’s character finalizing his divorce and I swear it is rarely brought up again in the movie. It’s all this randomness that causes the film to have a lack of focus. Comedy is about timing and focus. You can’t just have a bunch of random characters losing their minds on cocaine and alcohol and think it’s funny. Every actor seems to be playing into his or her standard brand of characters. Bateman’s the jerk who doesn’t have time for anyone else. Kate McKinnon does her wacky/odd SNL type caricature bit. Aniston has the hard, prickly edge. T.J. Miller is the outgoing teddy bear type. McKinnon and Miller come out the best. They garner a few laughs from the audience, but it is few and far between. This film also marks the fifth collaboration between Aniston and Bateman and both appear on autopilot. They are far better and far funnier than this material. They can be great comedic actors if given strong material like Friends or Arrested Development. Why do they keep making fuddy duddy movies like this? Is it a good paycheck? Office Christmas Party falls into the current trend where it ends in a gag reel revealing that many scenes were done through improvisation. It just feels somewhat painful watching the actors try to come up with better jokes and punch lines than what’s in the script. I want comedies to go back to actually being thoughtfully written out where timing and delivery matters. I don’t want just one gag bit after gag bit. At one point, I forgot it was this was even a Christmas movie. The holiday basically just serves as a time stamp and reason for throwing the party. Frankly, it could have taken place at any holiday. Maybe the sequel will be an Independence Day party or a Halloween party or maybe just no more parties. Is It Worth Your Trip to the Movies? With so many actually funny Christmas movies you can watch at home, no need to bother with this one. Darn, I had to miss the press screening for this one because it was playing the same day as “Lion”. So I was planning to pay to see it, but not after reading your review. It sounds about as funny as Vince Vaughn & Owen Wilson in “The Internship” – NOT. EEEK! I never saw “The Internship”, but it looked awful. Glad I skipped out on it.